Happy Birthday to us! Happy Birthday to us! 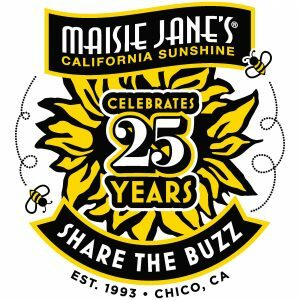 This month marks the 25th anniversary of the founding of Maisie Jane’s California Sunshine Products! 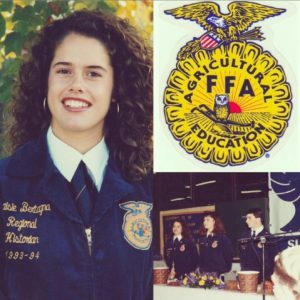 It all started when Maisie was just 17 and was raising sheep for a Future Farmers of America (FFA) project. At the time her family had been growing almonds for three generations and there was much talk around the dinner table about the problems of marketing almonds in the United States. California is the largest producer of almonds in the world but almost all the crop was exported (and much of it still is). Maisie thought that was odd. Her mom used to make delicious almond snacks at home—tamari baked almonds, caramel corn with almonds—but it was hard to find similar items at the local stores. So Maisie did her research, even calling the almond marketing giant Blue Diamond Growers and other retailers to pick their minds for potential ideas. It was then that she thought she saw an opening: the only potential competitors she would have deep-fried their nuts. But baking (or dry roasting) almonds makes a much healthier and extremely tasty product! She and her mom started experimenting with formalizing different recipes, starting with their family favorites and then branching out into three more: cinnamon glazed, orange and spice, and country herb and garlic. And finally she was ready to take the plunge. Maisie sold her flock of sheep for about $2000 and bought a ton of almonds from her family’s orchard. There was no turning back once that was done! So she dove right in making her flavored almonds and doing whatever she could to sell them to local grocery stores and at farmers markets and outdoor festivals. One thing led to the next and to the next and the next. And now 25 years later, here we are! Maisie and her husband Isidro grow, process and package hundreds of tons of almonds every year, sending them throughout the United States and Canada and around the world. The business also does custom processing and packaging for outside companies and sells almond products to national manufacturers as well as producing and selling our own line of nut products directly to a variety of retailers. Maisie, her family, and a growing crew of staff also operate an adorable little country store in Chico, CA where you can buy a wide variety of locally-made products, gift baskets and Maisie Jane’s products, many of which you can buy through our online store as well. It’s been quite the journey! And one of the best things is that it has been a family affair every step of the way. Maisie’s mom, Mary Jane, and her aunt Bobby Henry have been involved from the start, coming up with recipes, making and designing gift baskets and helping run the retail store. And now, once in awhile, you might find Maisie’s three daughters Isabela, Natalia and Lilia having great fun helping out at the store and starring in our local TV ads. Thank you for being with us. It will be interesting to see what the future brings and we look forward to sharing it with all of you.